Day 34: Highway 58 to Golden Oaks Spring. 17 miles. We started the day off slow at a nearby Denny's to pack as much breakfast food into my body as I possibly could before heading into the southern foothills of the Sierra, which contain an alarmingly low number of Denny's. As we sat eating breakfast, the audible torrent of wind outside rattled the restaurant's windows, ensuring I wouldn't forget what awaited me. We drove back up to where Mel had picked me up the day before on the side of the highway. I stepped out into the harsh gusts and threw my heavy backpack on. I looked up at the unappealing, brown hills I was about to head uphill into. "Happy birthday to meee..." I sarcastically sang to myself. Not being in a great mood, I put my head down and started walking. My psych for being back on the trail was near zero, so I was on autopilot. 'Every step you take is one step you'll never have to take again,' I kept reminding myself. With a heavy limp, I trudged uphill through the blowing sand, powerful gusts, and exposed sun. I had three liters of water and seven days of food, so my pack pulled at my shoulders in protest. Expansive views began to open up. Large bushes or Joshua trees would appear to provide momentary relief from the wind and a second to enjoy the view. My left foot slowly warmed up until I felt like I could move near a normal pace. The trail linked up with a dirt road and turned into a monotonous march. Luckily, the day was broken up a bit by meeting a couple more hikers headed southbound from Kennedy Meadows and chatting for a bit. One vista opened up with a sight that sent chills down my spine. This was the first time I'd been able to see snowy peaks to the north, waiting for me in the High Sierra. I knew I'd be one of the first to venture out into that vast snowscape, against the recommendations of the fine folks on the internet, who had assured me I would die. Pff, please. I'm not gonna die. ...I'm not gonna die, right? Ssssssandy, giving me the gift of standing there, wishing she'd hurry the hell up. Screw it. It's my birthday. It was still relatively early, but I stopped and threw up my tent. To celebrate, Melanie had sent a tiny bottle of wine with me so I broke it out and took small sips alone, ensuring it lasted for the entirety of my pathetic birthday party. Right as I was just about to start feeling sorry for myself, the German hiker Walkabout strolled up! I didn't know there were any hikers that close behind me and it felt good to see a familiar face. Walkabout decided he'd stay at the spring with me that night, so my sad, solo birthday party turned into a raging group of two! We partied deep into the afternoon, mostly by sitting in our tents and eating rehydrated mashed potatoes... The rager continued as I broke out the sewing kit and attended to the gash ripped in my pack from the barbed wire gate a couple days prior. Sewing, potatoes, AND wine?? You only turn 31 once, ya know? I decided the best gift I could give myself (and my feet) would be a long rest, so I turned in well before the sun had set. Worries about my painful feet nagged at me constantly, but somehow I found sleep between my panicked thoughts. Day 35: Golden Oaks Spring to Robin Bird Spring. 19 miles. I groggily opened my eyes to my 5 a.m. alarm. I had taken a PM Ibuprofen the night before for the first time. I groaned and creaked myself awake, trying to shake off the foggy cloud of heavy sleep. I wanted to get moving during the early hours of the day when I would be more productive. I threw a Pop-Tart in my pocket, rolled up camp, and headed out into the cold morning. I tiptoed past Walkabout's tent and scurried along the trail. I almost made it out of sight from camp before the Pop-Tart came back out of my pocket. Hiker hunger was up early too. My left foot felt surprisingly good, which might've just been a placebo effect from the long, deep sleep. Whatever was going on, I was smiling and taking full advantage of the dulled pain to put miles behind me. My stomach was fighting me from the start though. I couldn't seem to hike more than a couple miles before pumping the brakes and stuffing my face. At one snack stop, I broke out the snack I was looking forward to the most: Trader Joe's penguin gummies. I stood there, enjoying the world's most amazing gummy snack (this has been independently verified) when the bag slipped out of my hand. I watched in fat-kid horror as the bag landed upside-down, digging the open lip of the bag into the fine sand, then flipped right-side up, sending a handful of sand into the bag of gummy heaven. I looked into the bag and frowned the mightiest frown at my sand-encrusted gummies. In most scenarios, these gummies would be trash, but that wasn't an option. I continued down the trail, sucking the sand off of each individual gummy, then enjoying the gummy center of my sand snack. They were still amazing. THAT's how good these gummies are. Walkabout soon caught up to me, probably because he was walking and not eating constantly. I let him go ahead and continued along, a snack of some variety ever-present in my hand. As I walked, I could hear gunshots in the distance. Not a big deal, this area seemed to be a redneck playground. ATV and dirt bike trails were everywhere, along with their campsites where experiments investigating the flammability of aluminum cans and the durability of beer bottles on fire ring rocks were going down. The gunshots were rapid. Definitely belonging to a semi-automatic or maybe even automatic weapon. A little crazy, but it was still off in the distance. But it was getting closer. I continued along the trail and the shots were getting closer... and closer... until I was RIGHT there alongside them. Powerful bursts of rapid gunshot rang deafeningly through the air and the dense trees weren't allowing me to see who was shooting, or (much more importantly) in what direction they were shooting. I slowed my walk, praying they were shooting in a responsible direction, really any direction aside from in my general direction. Wandering toward the gunshots alone in the forest. Mom would not approve. I eventually saw several large car-camping tents set up in a clearing alongside a few gnarly off-road Jeeps. I breathed a sigh of relief when I saw they were shooting towards a banked hillside to keep the bullets on the ground (and not in my body/Thermarest, both of which being notoriously hard to patch in the backcountry). They were camped immediately off the PCT and as I got closer, I saw there were maybe 10 Middle Eastern guys sitting around drinking beer and holding AK-47's. As I turned the corner, every one of them stopped what they were doing and silently stared at me. I stopped in my tracks, kind of alarmed by their reaction. One of the men seemed nervous and called out to me in a heavy accent, "Hey. You need some water? Or a Powerbar?" 'Well, that's a good sign', I told myself and relaxed. I smiled and walked up to them, politely refused their kind offer, and talked a bit about what I was doing out there. A loud, light-hearted group, they were quick to proudly point out they were Lebanese and on a vacation from work and their wives. I made a joke about this white boy stumbling on a group of Middle Easterners with automatic weapons. I had a split second of foot-in-mouth regret... but they laughed and I was relieved they found it humorous. Perhaps risky jokes aren't a great idea when you're the only one without a gun. Mysterious, unattended bags?? If airports have taught me anything, it's to get in there and eat what's inside! They offered for me to stay and have a seat, but I had miles to make. I thanked them for their kind offers once again, then headed down the trail. Shortly after, there was a dirt road crossing. A trail marker had a dry bag attached to its base. Curious, I wandered over to the dry bag and opened it up to find a half-dozen MRE-style Mountain House meals and snacks! I took a spaghetti and meatballs meal, excited for the bonus dinner I would have that night. Every hundred marker feels amazing! I sat down for lunch and ended up eating WAY too much and sitting for too long. Once I was back on my feet, all I wanted to do was nap. I had once again set a goal for 20 miles, but when I stumbled upon Robin Bird Spring 19 miles into my day, 19 miles was going to have to do. It was early in the afternoon still. Walkabout appeared. I hadn't realized I'd passed him! He told me he would head onward for the day and get some extra miles in. I was jealous of his motivation, but double dinner night reassured me that I'd made the right decision. I sat on a log and did as much damage to my food bag as I was allowed to. As I was wrapping up dinner, a new face walked into camp. One of my pet peeves in the outdoors is when people know there's a law or restriction they should follow.... and then they blatantly ignore it. Most have the entitled attitude of "I shouldn't have rules placed on my hike. I'll just break the law until someone forces me to do otherwise". Typically, the actual breaking of the law is fairly inconsequential. For instance, walking through a closed section of trail is usually totally possible and safe. The problem is when authorities come across these hikers illegally walking through those sections. They simply see a PCT hiker blatantly disregarding a closure, which makes the rest of the thru hiking community look like garbage. He mentioned sticking together the next day and I noncommittally got out of the conversation and got into my tent. I set my alarm for 4 a.m.
Day 36: Robin Bird Spring to Bird Spring Pass. 29 miles. I woke to my alarm and immediately sat up and began packing my backpack as silently as possible so I didn't wake anyone. Of course, 'silently' isn't a word that can be associated with backpacking materials, because everything seems to be manufactured to be as noisy as the laws of physics will allow. Packing up basically sounds like I'm rolling around in a pile of newspaper for 30 minutes. As I stood up out of my tent, it was clear my effort to be quiet had failed. Shade sat up and groggily asked "How far are you going today?" "Low twenties", I vaguely answered. 'Before lunch, maybe', I silently thought to myself. Shade lied back down and I took off down the trail with motivation to put miles behind me. In the warm morning, I knew it was going to be an uncomfortable afternoon, so I set a fast pace which was interrupted almost immediately by waking hikers I was passing. After patiently waiting through long-winded water reports and tales of my impending doom in the Sierra, I seemed to finally be able to maintain a pace. Demon and the free candy Escalade! After some good progress, I was walking across a wide dirt road when a white Cadillac Escalade drove up and came to a quick stop. The man in the driver's seat rolled down the window and yelled out "You want some candy bars??" Now, if my mother taught me anything, you never turn down free candy from strange men. All red flags being thrown by my subconscious were blacked out by the prospect of food. Bill excitedly appeared from the back of the SUV with a dozen protein bars clenched in his fists... I felt like I needed to sit Bill down and have a heart-to-heart about what constitutes a damn candy bar, because if there's one thing I can't stand putting in my mouth, it's protein bars ...and probably spiders or something, but mostly protein bars. Not wanting to refuse their kind offer and come off as rude, I gratefully accepted the pile of mealy protein I would have to find a way to choke down later and had a quick chat with the two men. Both of them were amazing guys. Demon was a trail angel that stocked water caches for PCT hikers and Bill was an avid hiker who was psyched that he was able to offer me some impromptu trail magic (however mealy). I wrapped up our conversation and headed back on the trail. 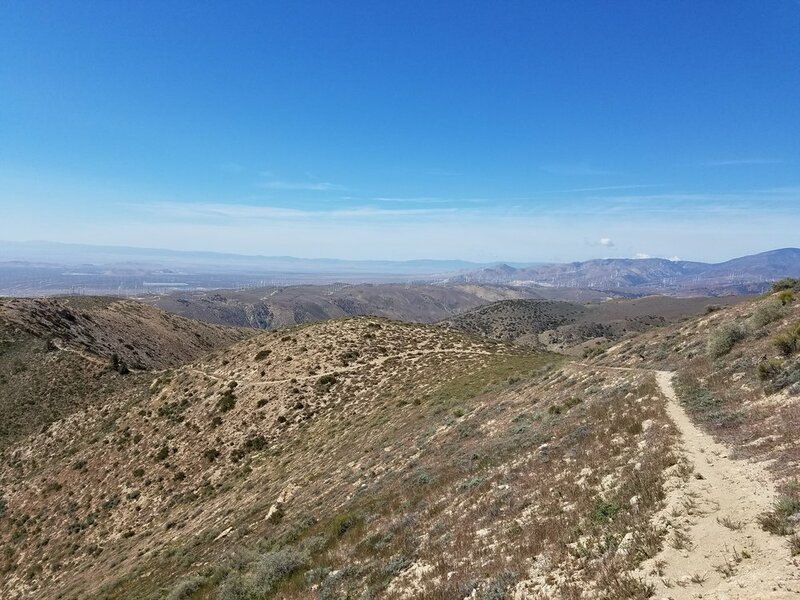 The trail opened up into many miles through waterless, hot, dry terrain. 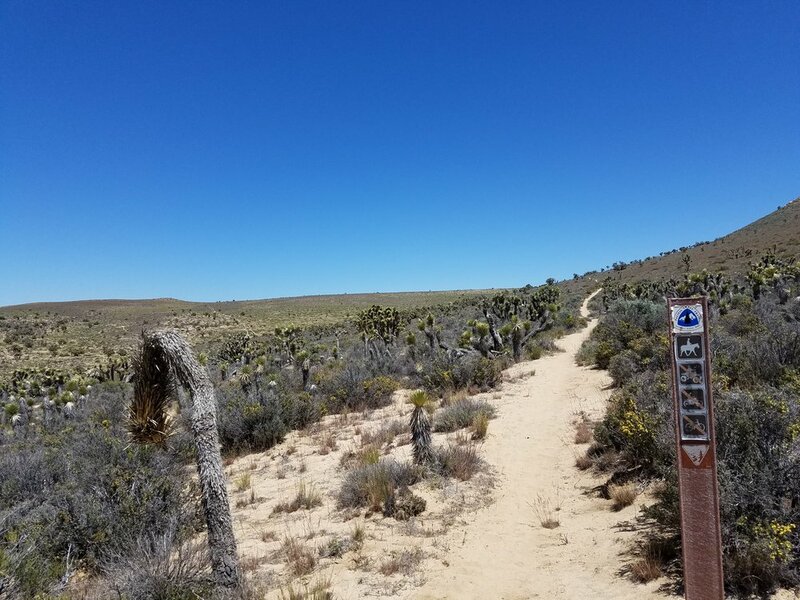 Much of the area had been burned at one point, exposing the trail and creating a dusty march through the barren landscape. After a long descent into a wide open desert, the paved Kelso Road appeared. To my left were several big, five-gallon water bottles and just up the road there was a huge assortment of plastic containers, all containing water for hikers. I was super grateful this had been stocked, took what I needed, and continued back into the desert. I only made it a hundred yards before I saw a red cooler sitting along the trail! On top of the lid, it said "Beer bucket Bobby. Please sign if you don't mind". I opened the lid of the cooler to an awesome assortment of beer, soda, fruit, water, and snacks, ALL on ice! Although there were better things to consume before a huge uphill hike through the desert, I grabbed an ice cold beer and scoffed at the fruit. Who needs nutrition when you can have dehydration, amirite? Is there a more beautiful sight than ice cold mystery beer in the middle of the desert? 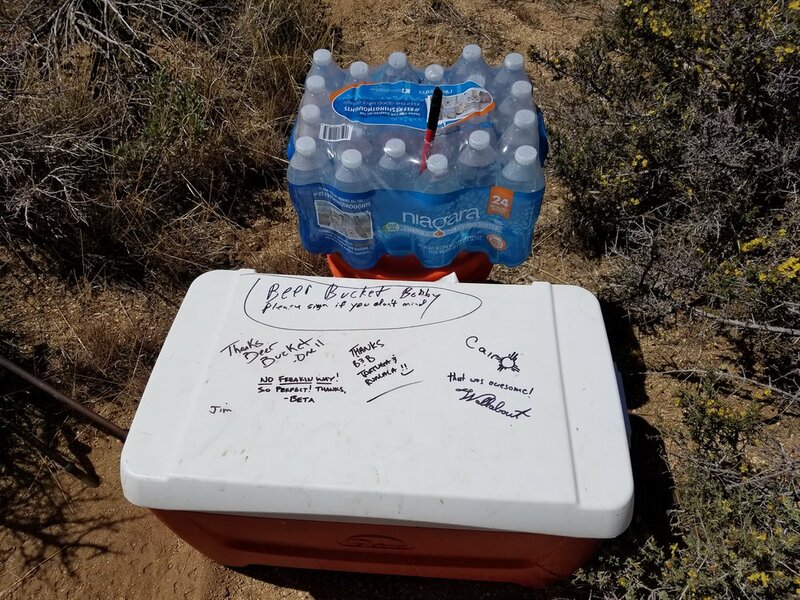 I signed the cooler and headed off with some added pep in my step, sipping the beer slow enough to enjoy it. The next few miles were long, uphill, and hot. My pep-infused step quickly slowed to more of a beer-infused trudge and I hiked from Joshua Tree to Joshua Tree to get out of the intense sun. As I descended from the long uphill, I hit hiker gold: a picnic table. Typically, eating during a hike involves sitting on a low rock, uncomfortably hunched over, cradling tortillas in your crotch, or holding a hot food bag in your crotch... Really there's just an alarming amount of food-crotch interaction. Food should be nowhere near a hiker's crotch. Well, to be clear, nothing should be near a hiker's crotch. I sat down and ate my crotch-free lunch, relieved to be sitting up like a person. Every few minutes, an off-road vehicle would fly up the dusty dirt road, come to a sliding halt, and the invariably tank-topped inhabitants would stare at me for several seconds before launching off into the desert again. Why this happened over and over, I have no clue. Maybe the sudden appearance of a vehicleless person in the middle of the desert? Maybe it was the smell? Maybe they were wondering why my food wasn't in my crotch? I set off back into the desert, somehow still marching uphill. Getting past 20 miles felt more difficult than most days, but I still had motivation to keep moving... The trail started to soften as it joined with an old dirt bike trail. Dirt bikes have the impressive ability to turn hard dirt trail into pillowy soft silt trail. Sometimes those trails are uphill in the desert for six miles. I slowly trudged up the steep, sandy trail with my head down, occasionally looking up to make sure I wasn't getting any closer to the top of the massive hill in front of me. If there had been any campsites right there, I would've stopped, but there wasn't. Just old dirt bike trail and challenging things to pitch a tent on, such as cactus and... other cactus. Every step I took would slide back a few inches, somehow depositing a little bit of dirt into my socks in the process. As my socks filled to capacity, my patience for the trail was wearing thin. After six miles of swear-filled trudging, I was gifted some downhill sand to add to my sock-sand collection. I moved quickly, ignoring all the various discomforts going on around my body and got to Bird Spring Pass. The long day allowed me to catch up to Walkabout, who was already set up at the pass. It was good to see a familiar, non-irritating face. A man who introduced himself as Badfish was also there. He was loudly chatting with Walkabout and instructing him in the various methods of crossing Sierra creeks, sitting in the dirt and making swimming motions, careful not to spill the Coors Light can in his right hand. I'm sure the beer had nothing to do with the dirt river survival training. 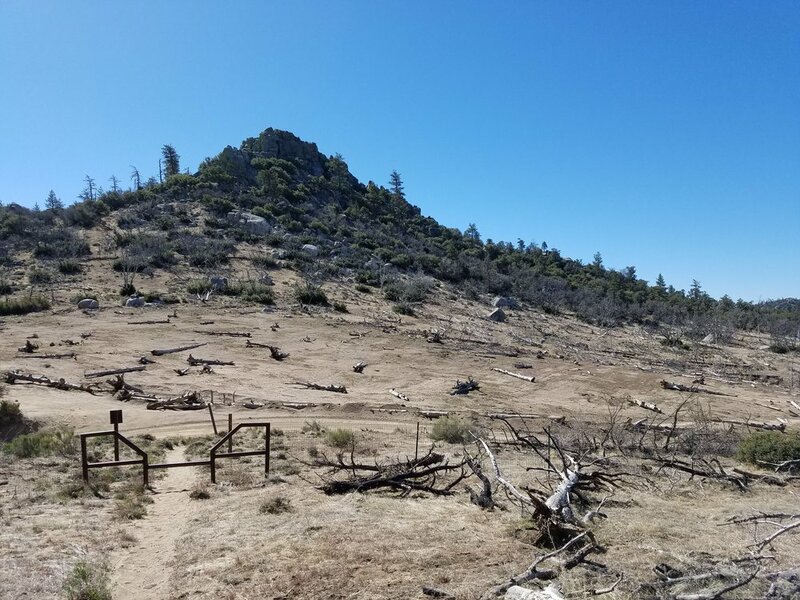 Badfish was actually responsible for maintaining the water caches in that area for PCT hikers! He was a great guy and immediately ensured I had as many beers as I could handle. Before I could even set my pack down, I was drinking a Coors Light and had three other beers stacked in my greedy paws. What the hell was I thinking?? I needed to rehydrate some pasta and eat dinner, not play beer pong with my frat buddies! I set up my tent in the windy evening. As the light faded away, I finished dinner in the company of my sea of beers. I figured I could stash one in my pack for later and donate the rest to the water cache in case any hikers needed a smile and some dehydration to help them along through the next desert stretch.